The following video 1 is a must-see for anyone who is interested in listening to one of the most qualified, eloquent and devoted advocates of using nutrition as a primary medical tool. 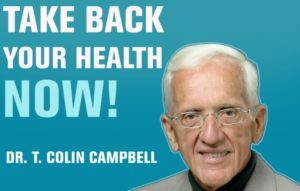 Dr T Colin Campbell has been at the forefront of research into the effect of nutrition (good and bad) on human health. As the coauthor of the bestselling book The China Study 2 , the New York Times bestseller Whole 3 , and The Low-Carb Fraud 4 , he appears in several documentaries (some of which are paid-for, others are free and some are on Netflix) including the blockbusters Forks Over Knives 5 , Eating You Alive 6 , Food Matters 7 , Plant Pure Nation 8 , H.O.P.E. – What You Eat Matters 9 , Cowspiracy 10 and others. He is the founder of the T. Colin Campbell Center for Nutrition Studies 11 and the online Plant-Based Nutrition Certificate 12 in partnership with eCornell – a course that I completed myself and would recommend to anyone who is interested in getting to know the facts about nutrition rather than just the gossip and misinformation that so often floods the media and does the rounds within the general public. He has conducted original research both in laboratory experiments and in large-scale human studies; received over 70 grant-years of peer-reviewed research funding (mostly with NIH), and has served on grant review panels of multiple funding agencies. What’s more, he has actively participated in the development of national and international nutrition policy, has given hundreds of lectures around the world, and has authored over 300 research papers 13. He currently holds his Endowed Chair as the Jacob Gould Schurman Professor Emeritus of Nutritional Biochemistry in the Division of Nutritional Sciences at Cornell University, USA. His early training was at Cornell (M.S., Ph.D.) and MIT, where he was a Research Associate in nutrition, biochemistry, and toxicology. Within the world of nutrition science, there are few more respected scientists than Dr Campbell. I recommend that you not only watch this video, but that you watch the above-mentioned documentary films and read the above-mentioned books. It’s hard to imagine any other living person other than Dr Campbell who could provide a better source of reliable and cutting-edge information on the essential role of nutrition in maintaining and improving human health. If what he has to say resonates with you, perhaps you could consider signing the petition for Dr Campbell to receive the Nobel Prize in Medicine – see my earlier blog 14 .